I secretly love it when a word like “pudding” takes on a whole new meaning than “the sweet chocolate goop found in the refrigerator cases of American supermarkets” (although I do enjoy that sort of pudding as much as the next sugar crazed mom). I love surprises like this because they teach me not to take so much for granted. They remind me that there are people all over this beautiful world who have different ways of doing things. And, in case you didn’t get the memo, different is a beautiful thing. 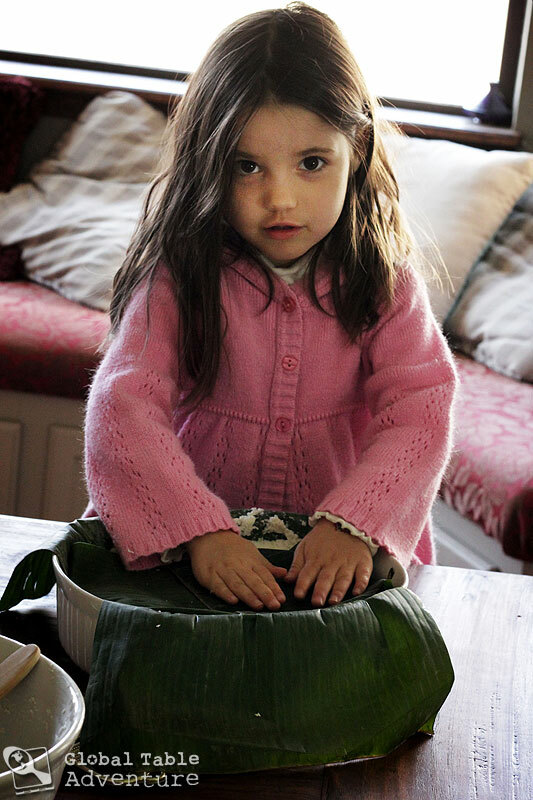 Imagine how boring our world would be if we all looked the same, talked the same, and… ate the very same pudding? 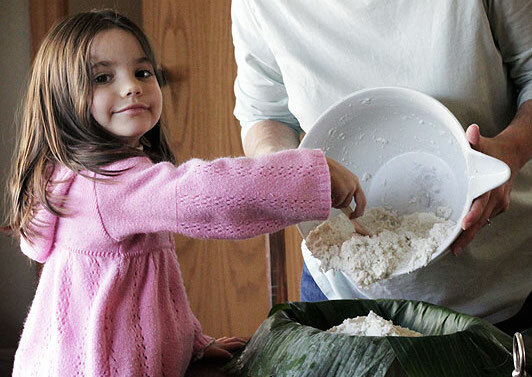 In Solomon Islands and throughout Oceania, pudding is any goupy mixture that’s been grated and baked. Or sometimes steamed. 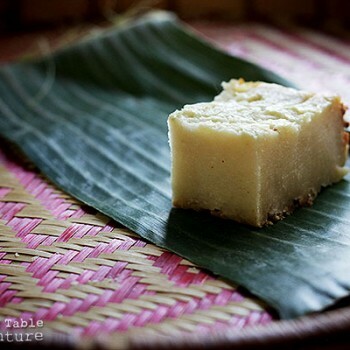 The most popular pudding in Solomon Islands is Cassava Pudding. This is more of a savory cake than pudding. 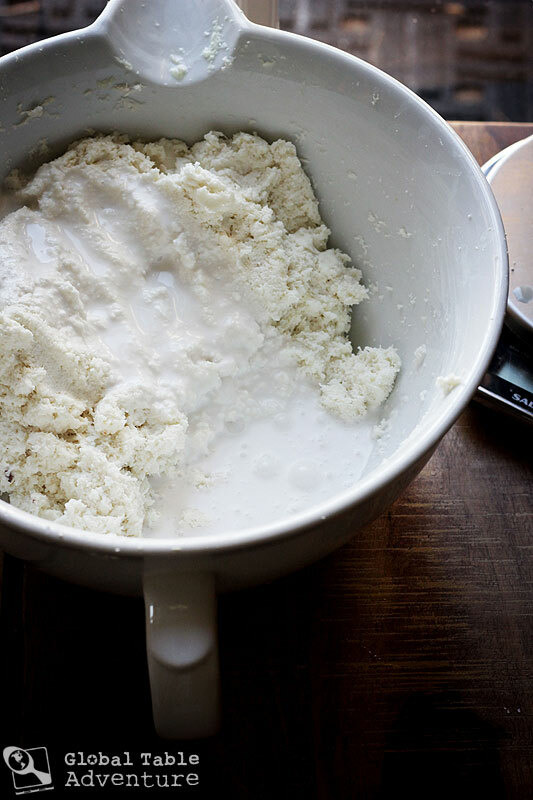 It’s made with grated cassava, sweet potato, and coconut milk. The whole shebang is traditionally baked all afternoon in a motu, or outdoor oven, under scorching hot stones, banana leaves, and even a layer of insulating blanket. Even after baking, the “pudding” is wet and jiggly… it’s only after the mixture cools off that it becomes firm enough to slice. I knew immediately that I wanted to try Cassava Pudding. 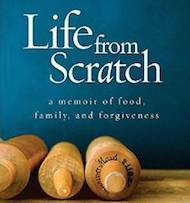 The recipe had the right amount of cultural significance and interest. But, after a glance out at our snow covered back yard, I also knew I needed to make a version accessible for the home cook – someone who only has an indoor oven at their disposal. Maybe even someone in a 10th floor apartment in NYC. Gather a couple of tubers of cassava… You can find it in the your supermarket’s produce department (I found it at Whole Foods), or in any latin grocer. Or… in the Solomon Islands. 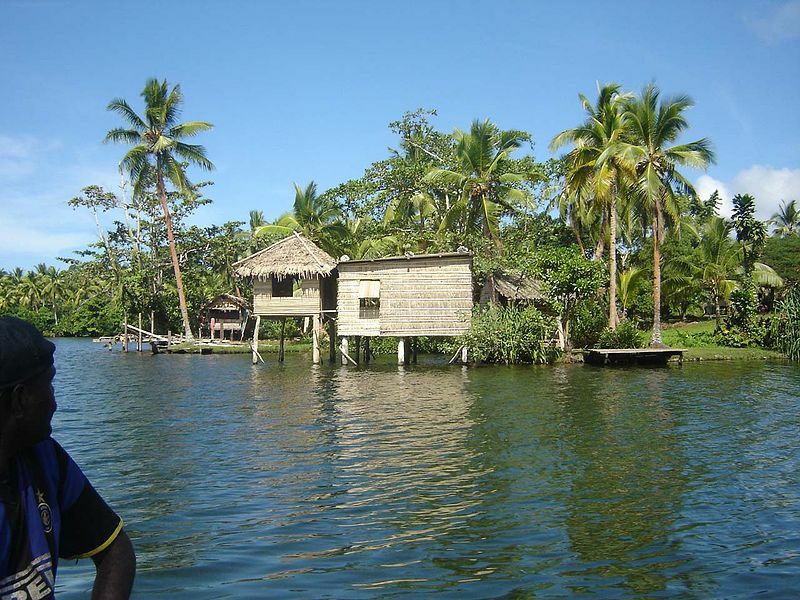 View of a typical house besides the water. Photo by Phenss. Peel & cut the cassava into large chunks. 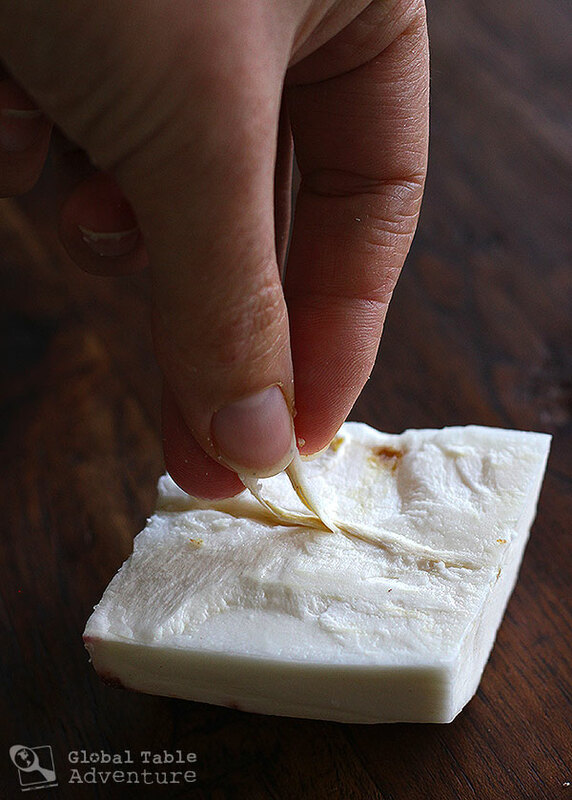 Using a knife, cut out the woody fibers in the center (they can contain traces of cyanide and should not be added to the pudding). 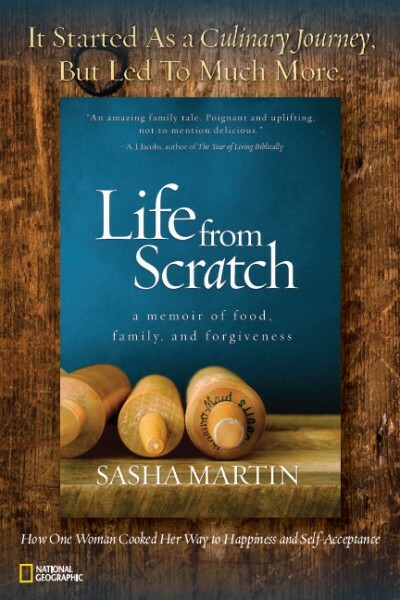 Next, put on an audio book or invite some friends over… all while you grate the cassava. The whole process took me 1-2 hours. The grater I used does not have any holes, just an abrasive texture… it worked great and kept my knuckles cut-free. Next, peel & grate the white sweet potato, adding it to the bowl of cassava. 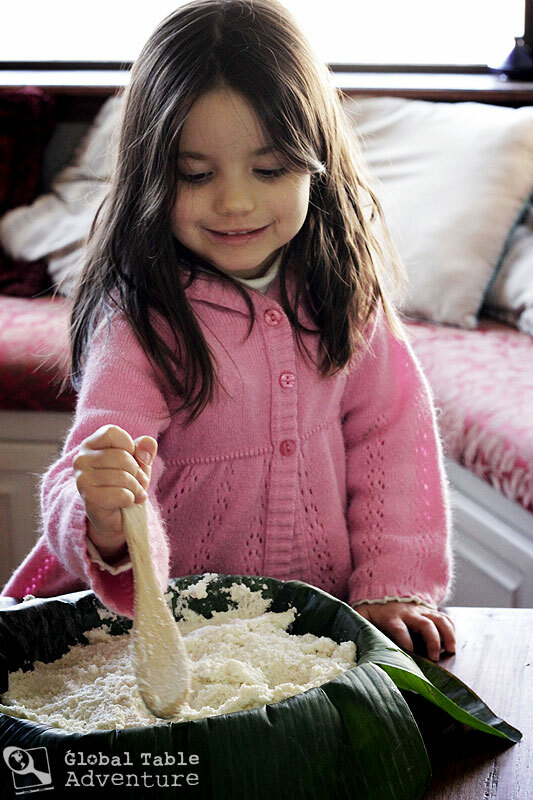 Using cheesecloth or cotton, squeeze out the grated cassava and sweet potato. Twisting the fabric is the easiest way to do this. Reserve the liquid in a bowl. After 15-30 minutes, pour off the liquid you reserved into another bowl. 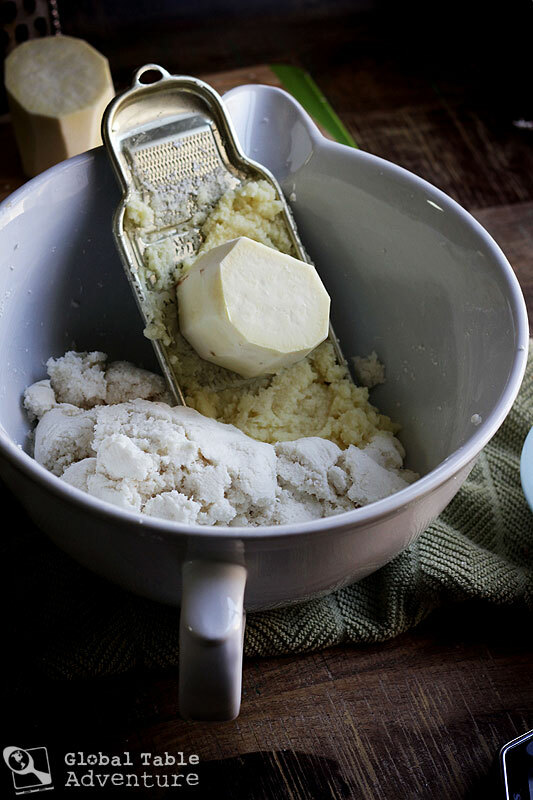 At the bottom you will find a couple of teaspoons of thick white liquid – this is starch. Add it back to the gratings; it will help thicken the pudding. Next, pour the coconut milk onto the cassava mixture, only adding enough to create a mashed potatoes like consistency (see video). I used 1 large can and one small can, or 18 fluid ounces. 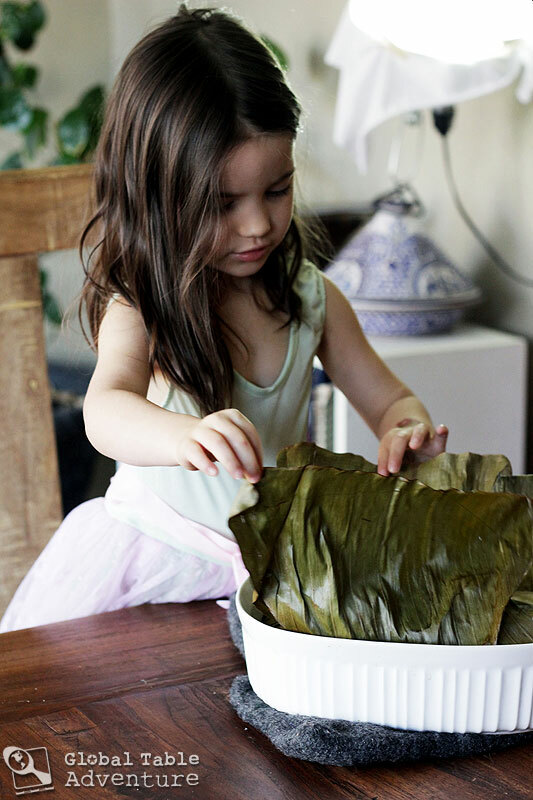 Meanwhile, soften some banana leaves over a open flame, to make them more pliable. A gas burner works great for this. 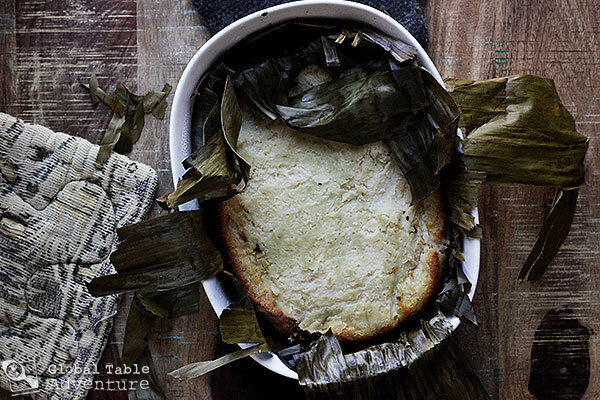 Line a baking dish with the banana leaves (make a large cross with them) and spoon on the cassava mixture. Cover tightly with a lid or foil and bake at 350F for about 3 1/2 hours… or until browned on the edges. The mixture will still be wet and mushy. Set aside to cool and harden. Slice into squares and serve with grilled fish, steamed pumpkin, or PawPaw Curry. Remember, this one isn’t supposed to win any beauty pageants. In fact, if it were cooked on hot rocks, it’d end up even bumpier and there’d be even more brown spots, like this. Enjoy the irregularities of life. They often taste the best. 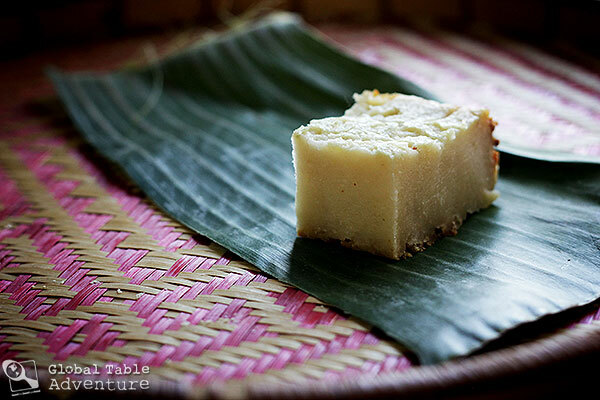 The most popular pudding in Solomon Islands is Cassava Pudding. This is more of a savory cake than pudding. It’s made with grated cassava, sweet potato, and coconut milk. The whole shebang is traditionally baked all afternoon in a motu, or outdoor oven, under scorching hot stones, banana leaves, and even a layer of insulating blanket. 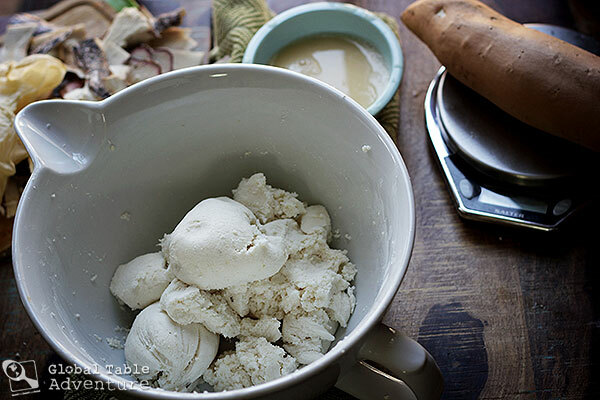 Gather a couple of tubers of cassava… You can find it in the your supermarket’s produce department (I found it at Whole Foods), or in any latin grocer. Peel & cut the cassava into large chunks. Using a knife, cut out the woody fibers in the center (they can contain traces of cyanide and should not be added to the pudding). 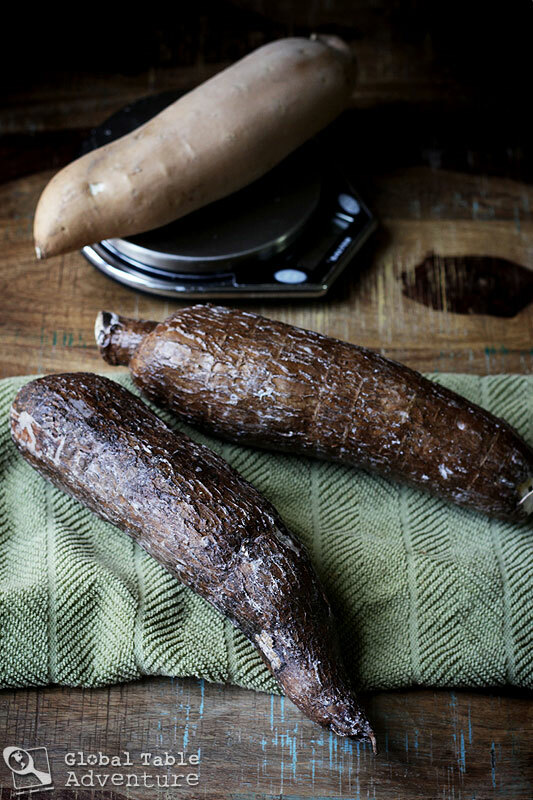 Grate the cassava then peel & grate the white sweet potato, adding to a bowl. 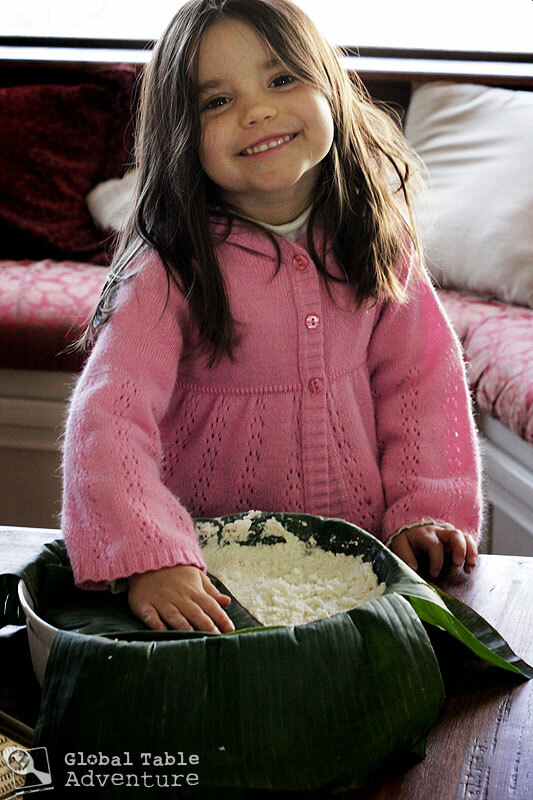 Using cheesecloth or cotton, squeeze out the grated cassava and sweet potato. Twisting the fabric is the easiest way to do this. Reserve the liquid in a bowl. The squeezed out gratings will become dry. After 15-30 minutes, pour off the liquid you reserved into another bowl. 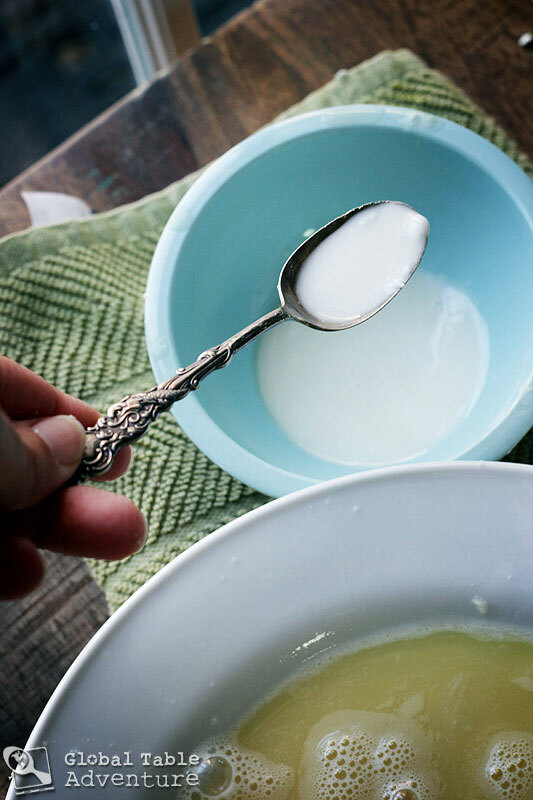 At the bottom you will find a couple of teaspoons of thick white liquid – this is starch. Add it back to the gratings; it will help thicken the pudding. 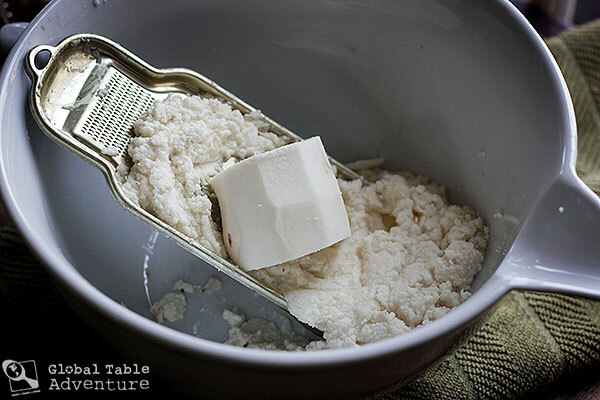 Next, pour the coconut milk onto the cassava mixture, only adding enough to create a mashed potatoes like consistency. I used 1 large can and one small can, or 18 fluid ounces. Preheat the oven to 350F. 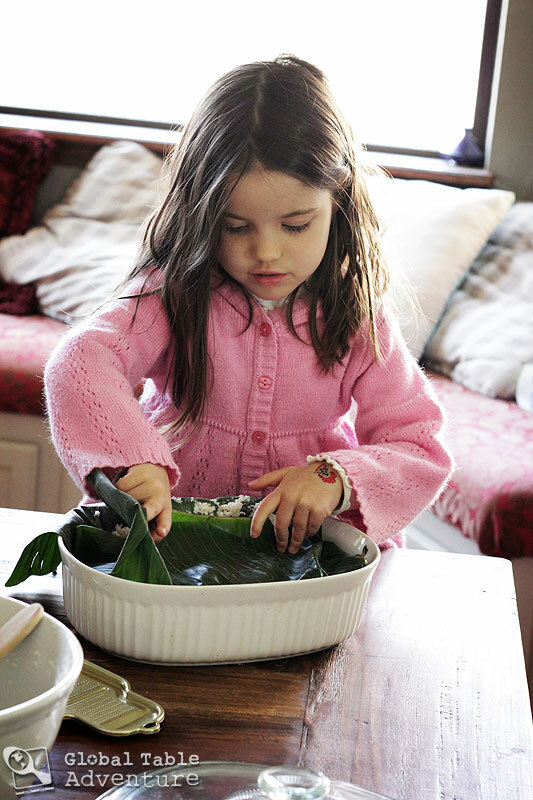 Meanwhile, soften some banana leaves over a open flame, to make them more pliable. A gas burner works great for this. 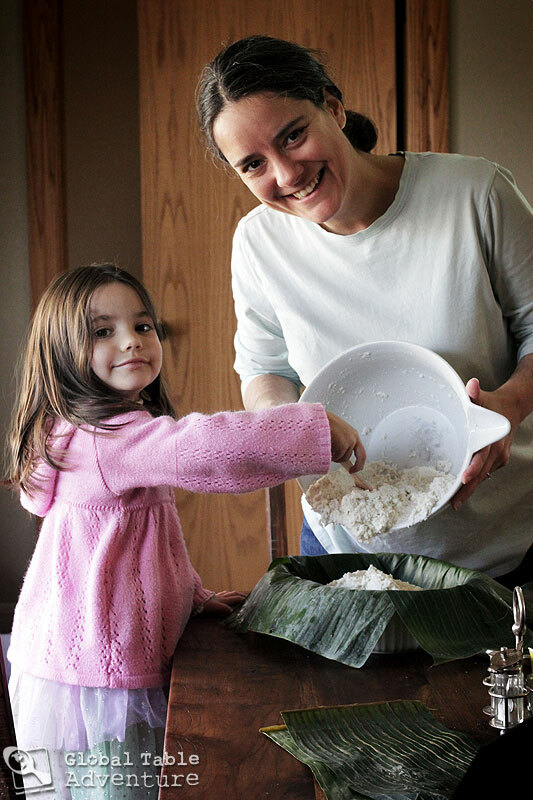 Line a baking dish with the banana leaves (make a large cross with them) and spoon on the cassava mixture. 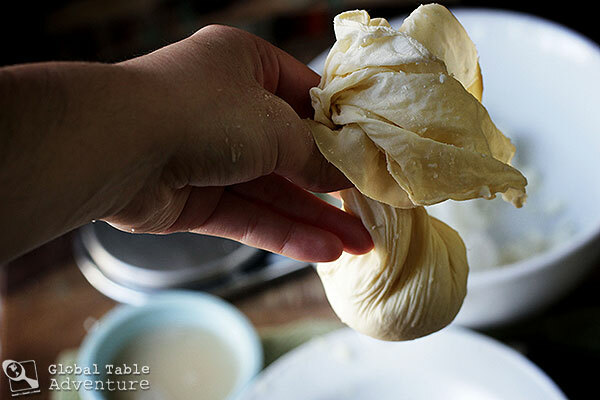 Get everything smooth and flat, then fold the banana leaves back over the cassava mixture. Cover tightly with a lid or foil and bake at 350F for about 3 1/2 hours… or until browned on the edges. The mixture will still be wet and mushy. Set aside to cool and harden. 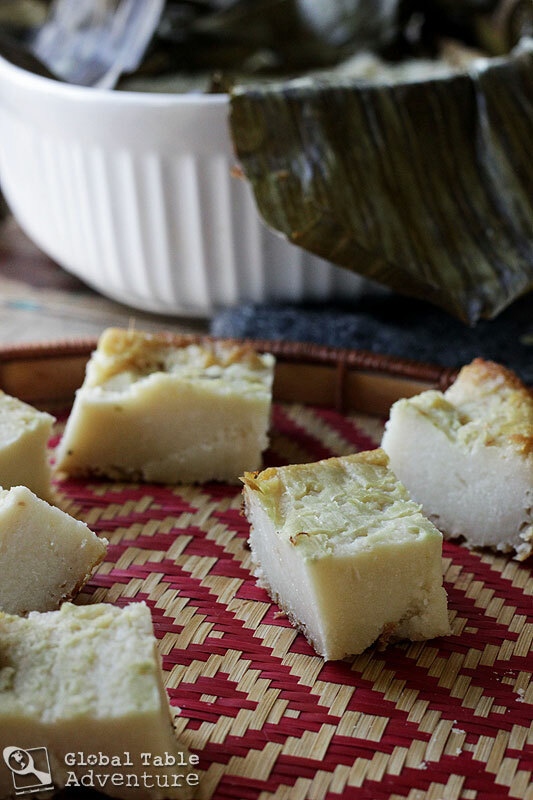 Slice into squares and serve with grilled fish, steamed pumpkin, or PawPaw Curry. Remember, this one isn't supposed to win any beauty pageants. It is always great to see how similar dishes are across the world. This is exactly how we make some postings in Jamaica- even the banana leaves. We wrap individual portions. Many still cook them on coal stoves. 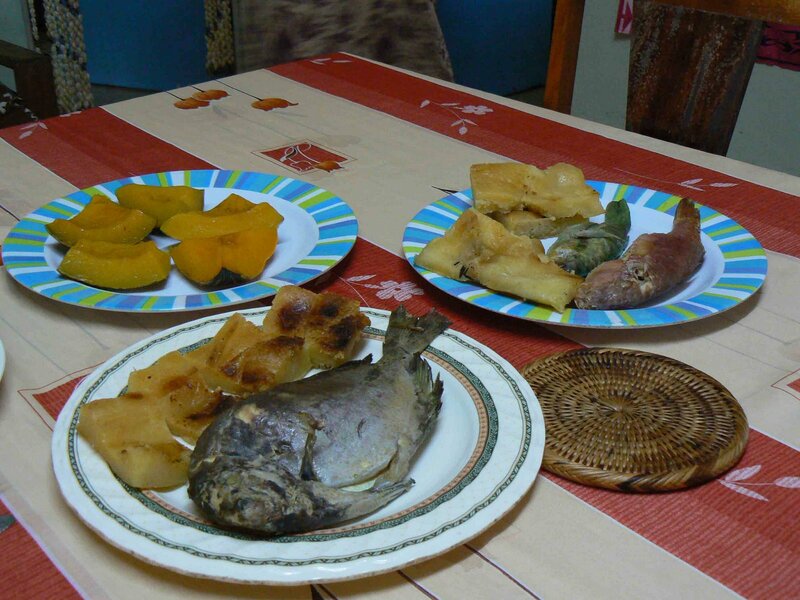 I feel like I just took a lovely vacation to stay with relatives in the Solomon Islands and cook with them! What a great article with a well done slide show (compliments to its clever maker) and your own American way of making the same dish. Thank you for the free trip! I don’t think I could have done it without that video. It’s amazing how helpful a slideshow/photos can be to clarify instructions! Wow..thats lot of work Sasha.I applaud you for making this.